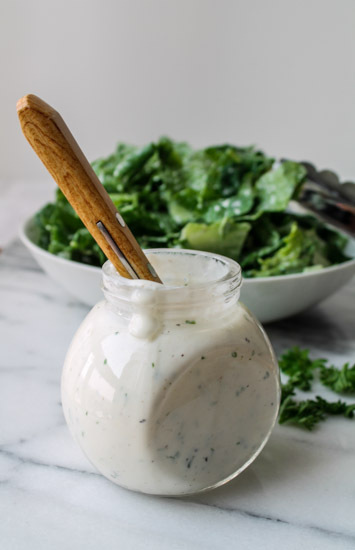 A great dressing makes a great salad, and here are 7 healthy salad dressings that turn even a pile of lettuce into a delicious meal. A fantastic salad is one of my favorite types of meals. It’s a great way to enjoy leafy greens loaded with iron, chlorophyll, vitamins, fiber, antioxidants, and other nutrients, and it can be topped with protein, veggies, seeds, nuts, and a bunch of other nutrient-dense foods. But what really makes or break a salad is the dressing. A great dressing makes even a bowl of iceberg lettuce delicious, whereas a bad dressing will ruin even the most creative ensemble of ingredients. Many store-bought dressings are loaded with calories, preservatives, and other chemicals, which is why I prefer to make my own. These seven healthy salad dressings will help you enjoy more salad without getting bored and – more importantly – without pouring on hundreds of calories. Keep in mind that the serving size is (on average) only 2 Tbsp. per cup of salad. That’s a ratio of only 1:8 so by no means should you wind up with soggy spinach leaves or a puddle on the bottom of the plate. Another good tip for limiting dressing use is to have the dressing on the side and dip your fork in it before going for a stab of lettuce. You’ll eat quite a bit less dressing this way and still enjoy every bite. This low-fat dressing has little for picky eaters to complain about, but packs in plenty of flavor with three types of ground pepper – plus balsamic, onion, garlic and flax. It’s the perfect match for a simple garden salad with cherry tomatoes, cucumber slices and shredded carrot. 1. Combine all ingredients in a blender. Once smooth, transfer to a bowl. 2. Allow to thicken in the refrigerator for at least a half hour. Stir, and serve. 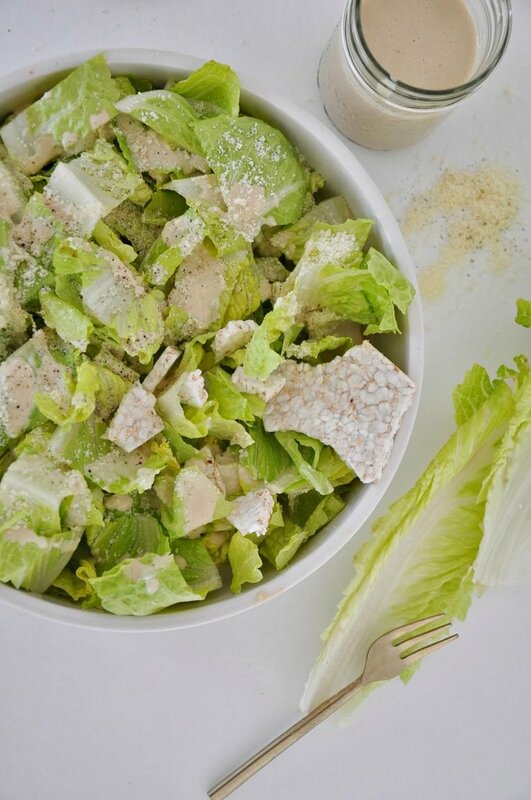 When ordering a salad as a lighter, healthier lunch option, too many people make the mistake of going with Caesar. Well, even “healthy” brands like Newman’s Own have 18 grams of fat per serving! 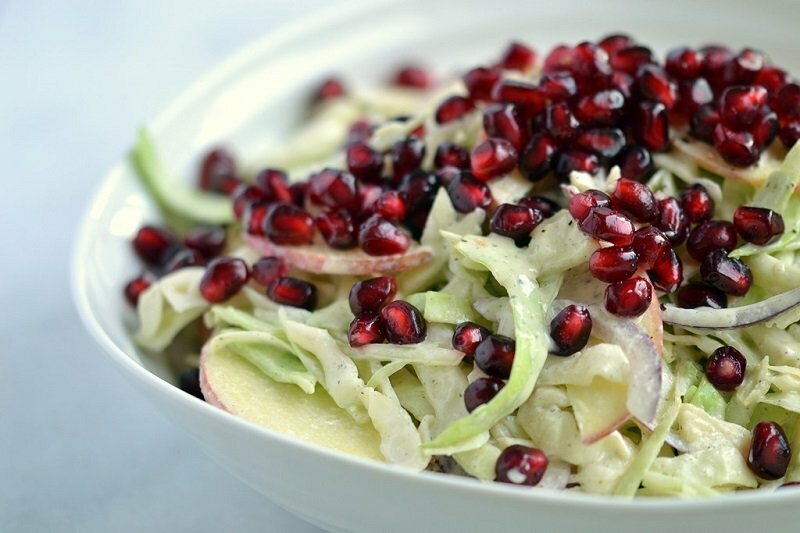 Indulge your taste buds without wrecking your diet by choosing this homemade alternative. Every now and then nothing satisfies quite like an old favorite, especially one like this from childhood. 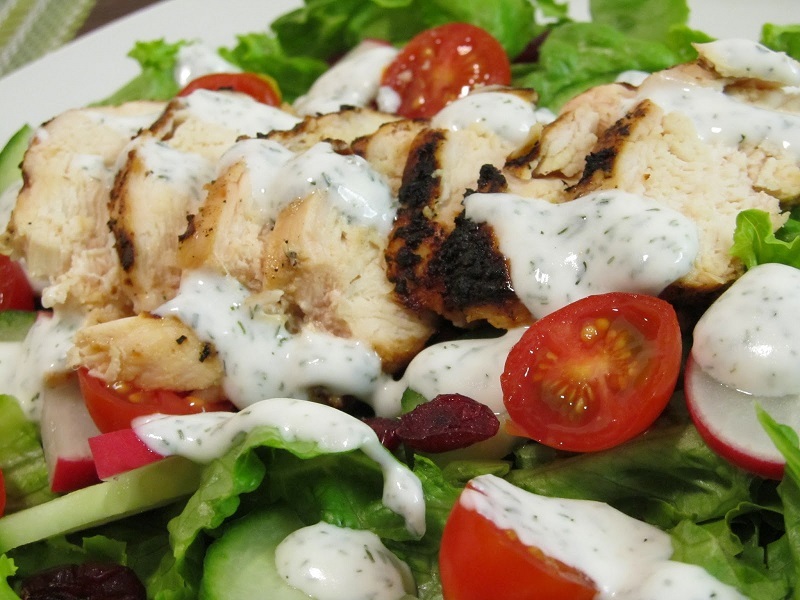 Instead of ranch dressing from a bottle or seasoning pouch, make it from scratch with a few standby herbs and spices. 1. Mix together all herbs and spices to make homemade ranch seasoning. 2. Combine the Greek yogurt and buttermilk, and stir in 2 Tbsp. of ranch seasoning. 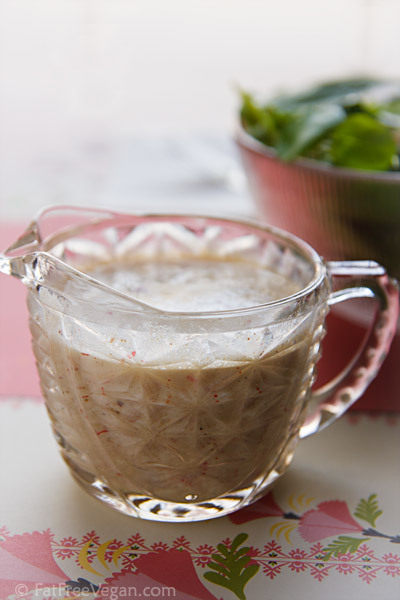 This salad dressing will perk up a simple mix of lettuce, almonds, and cranberries, but you can also use it to finish other vegetables like Brussels sprouts, carrots and sweet potatoes. 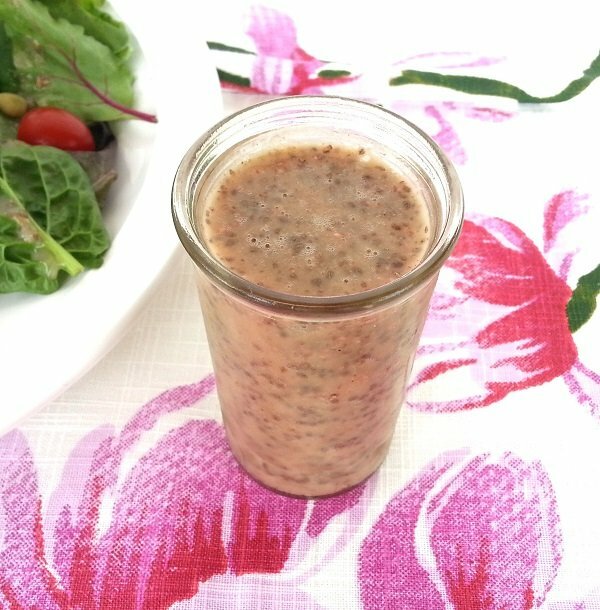 Because the chia seeds absorb nearly ten times their size in water, turning into a gel, they are a great way to thicken salad dressing while boosting nutrition. 1. In a small bowl, mix the chia seeds and water, and let sit for about a half hour, stirring occasionally until all liquid is absorbed. 2. Mix together all ingredients until well blended. 3. Use immediately, or store in the refrigerator. Craving a creamy, cheesy salad? Instead of blue cheese or cheddar, enjoy a goat cheese dressing to get all the benefits of this alternative dairy. 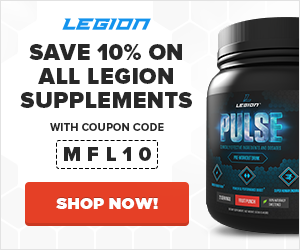 Goat milk is easier to digest, in part because it’s lactose-free, and your body will get a greater dose of iron, calcium, phosphorous, magnesium and vitamins A, B6 and D.
1. Place all ingredients in the bowl of a blender or food processor, and pulse until well combined. 2. Cover, and refrigerate for up to two weeks. Almond butter addicts (like me) can now enjoy it on their favorite leafy greens too. This dressing packs in a little healthy fat and protein from hemp seeds, vitamin C from fresh orange juice, along with the many medicinal properties of ginger. Plus, if you choose raw unfiltered apple cider vinegar, you’ll be reaping various health benefits from this as well. 2. 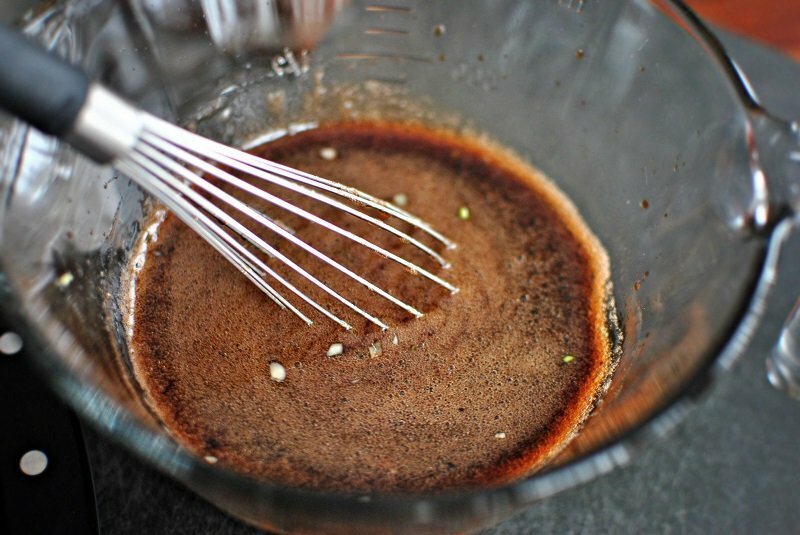 If not using hemp seeds, you can simply whisk all together until smooth. 3. Store any extra dressing in the fridge. Have everything but the salad except a bottle of dressing? Don’t worry; your fresh produce won’t go to waste. Chances are you have these four simple ingredients in your pantry. And for a little zing, you can add some spicy mustard to the mix. The final result is delicious and works with all veggies (and some fruits too). 1. Measure all ingredients into a small bowl, and emulsify with a fork. What did you think of these healthy salad dressings? Have anything else to share? Let me know in the comments below!